A dead raccoon named as Conrad on Twitter may be gone, but certainly the Raccoon won’t be forgotten, according to one tweet by @jasonwagar. The animal was left on a Toronto sidewalk for 14 hours before Toronto’s animal services unit was pressed to take it away. 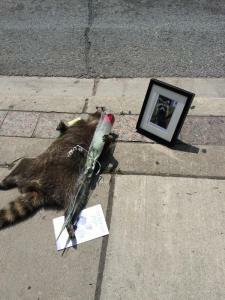 #DeadRaccoonTO was the twitter hashtag used by residents of Toronto for this Memorial of Raccoon. @311Toronto There’s a dead raccoon on the sidewalk outside 819 Yonge (at the SE corner of Church). The 311Toronto replied promptly, that animal services had been contacted and the raccoon would be taken off shortly. However, nobody showed up till the night fall. So a memorial began to take shape. Around noon the raccoon was still there. And someone put a note next to it. Instagram came in too with Raccoon update: he’s still here. Someone has written him a card. Raccoon update: he’s still here. People have set up a memorial, some leaving farewell messages. A flower was then placed next to the deceased raccoon, the beginnings of a memorial of sorts. Around 11 p.m., a worker from Toronto Animal Services arrived on the side walk. and By that time, the #DeadRacoonTO story was also being captured and tweeted by a freelance journalist. Well The Point is this Raccoon doesn’t have to lay like this on the street. Ideally it should be taken to the nearest natural habitat to live there without creating a buzz in social media. Raccoon Control is tricky thing. If you have a raccoon problem and you dont want to be famous in social media, you’ve just come to the right place. Call today! and Exopest will fix you problem with Raccoon Control Services. At Exopest we take care all of your pest control needs. Exopest deals with Rodent pest control, Bird proofing, Flying and Crawling Insects, Bed Bugs control, Carpenter Ants, Pharaoh’s Ants and other more exotic pests. Call 604-760-1542 for free Evaluation. On February 22, 2012, the Committee on the Status of Endangered Wildlife in Canada (COSEWIC) sent the Minister of the Environment emergency assessments for three bat species at risk (Northern Myotis (Myotis septentrionalis), Little Brown Myotis (Myotis lucifugus) and Tri-colored Bat (Perimyotis subflavus)) threatened by white nose syndrome, a fungal pathogen that is severely impacting bat populations. In November, 2013 COSEWIC re-examined the status and confirmed it. Environment Canada is now consulting on changes to the List of Wildlife Species at Risk to reflect these new designations for these species and solicited comments from interested parties as to how listing would affect their interactions with the species. Most exclusion services are performed on private property, not Federal lands, therefore inclusion of the three bat species on the List of Wildlife Species at Risk under the Species at Risk Act would not impact most bat exclusion services provided by pest management professionals. Currently, provincial legislation prohibits harassment and killing of all threatened or endangered bat species and in accordance our industry observes these provincial requirements. CPMA submitted comments indicating that although bat-friendly methods were already employed by PMPs, it would welcome opportunities to collaborate on developing best practices for relocation and exclusion.